The new Swedish coach of the Norwegian men’s national football team could end an otherwise disappointing round of World Cup qualifiers on an upbeat note Sunday night. 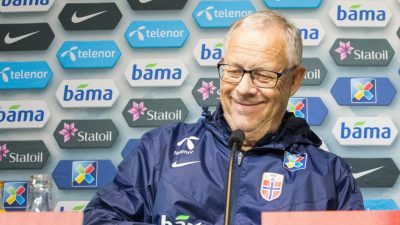 Norway’s surprising 1-0 victory over Northern Ireland raised hopes for the future under Lars Lagerbäck. Especially on defense, according to football commentators who claimed the Norwegians did better than they have for a long time. The victory was especially sweet for Lagerbäck since his debut as the Norwegian men’s head coach ended with a “nightmare” loss against Northern Ireland in Belfast last spring. Northern Ireland went on to finish second only to Germany in the World Cup qualifying group that also included Norway, the Czech Republic, Azerbaijan and San Marino. Norway wound up fourth after the disappointing round of qualifiers that began last year under Lagerbäck’s predecessor, Per-Mathias Høgmo, who finally quit under pressure after failing to produce the desired results. Lagerbäck, fresh from taking Iceland to heights believed impossible at last year’s European Championships, was brought in just after New Year to revive the Norwegian squad. Earlier losses made it impossible for Norway to redeem itself sufficiently for World Cup action, with only Germany and Northern Ireland winning spots from their qualifying group in the international competition set to play out in Moscow next summer. But Norway’s next generation of men’s football players now seems more likely to find their stride under Lagerbäck, who also was being praised for at least being unbeaten as national team coach at home in Oslo, where Norway has been undefeated under his leadership against the Czech Republic (1-1), Azerbaijan (2-0) and, now, Northern Ireland (1-0). Sunday’s victory clearly ended the round on a high note, coming just days after the Norwegians trounced San Marino by their highest score in decades, 8-0. “This is good,” team captain Stefan Johansen told NRK when Sunday’s match against Northern Ireland was over. “We have shown that we have made great progress since we met them (Northern Ireland) last time.” Norway had held off Northern Ireland all through the first half, with the winning goal coming around 20 minutes before the match ended. It was even a goal mistakenly allowed in by the goalkeeper for Northern Ireland, Chris Brunt. Instead of sending the ball from Johansen himself out again, Brunt fumbled and sent it into the net. “It was the goal of the year, right?” joked Johansen afterwards. “Now we’ve won two matches in a row, and that’s great,” said Norway’s goal keeper Ørjan Håskjold Nyland. A round of friendly matches for the national team looms, with no major competition until a new Nations League match next September, after the World Cup is over.